Distinguished epitome of Oriya virtues, Debendra Prasad Das was felicitated on his 71st birthday by Orissa’s nationalistic journal Subartta in its Bhubaneswar premises on Baula Amavashya, the 11th day of January 2013, with a symposium on ‘Oriya Asmita’, a topic that matched with the mission for which Sri Das has devoted his life. It was also the 111th birthday of his famous father late Alekh Prasad Das, the great freedom fighter who had refused to join post-independence politics to pursue the programs conceived by Gandhiji for emancipation of the people in the grassroots and had even enriched them in their applicability as a real Gandhian, defying the climate of self-seeking politics that his contemporaries were indulged in after independence. He was recalled with utmost reverence as his birthday coincided with that of his son. On the occasion, the congregation paid glowing tributes to the famous radical fighter for freedom Vir Baishnab Charan Pattanayak the valiant; and revered Gandhian Smt. Annapurna Maharana as well as Binod Tripathy, the famous propagator of the richness of Oriya language through Pala performances. The people shall remain ever indebted to these four avatars of love for the motherland, the speakers in the symposium said. Presided over by former Director of Orissa Treasuries Hemant Kumar Das, the symposium was addressed by Somanath Patra, Natabar Khuntia, Laxmidhar Kanungo, Tusarkant, Prahllad Singh, Subhas Chandra Pattanayak as well as Debendra babu’s younger brothers Prof. Narendra Prasad Das and Prof. Brajendra Prasad Das. Prominent amongst the audience were Smt Rekha Das, Dr. Kamalini Das, Smt. Chandrlekha Devi, Smt. Aditi Das, Smt. Divyadarshini Das, Smt. 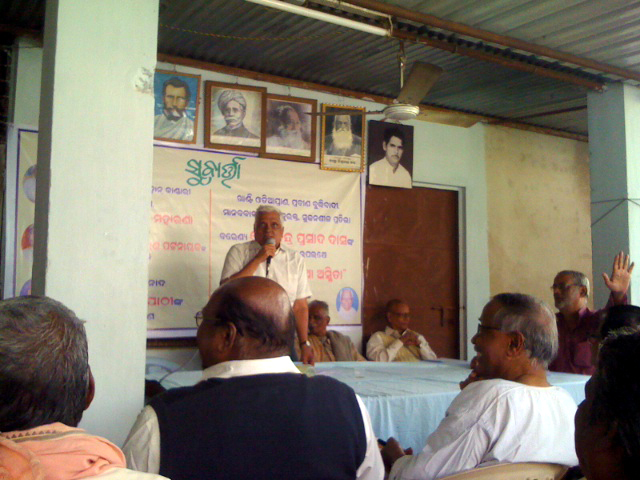 Prativa Ray, Dr. Saroj Kumar Mohanty, Dwarika Mohan Mishra, Pabitra Mohan Maharatha, Durga Charan Sarangi, Balakrushna Pradhan, Nirmal Jena, Golakh Rath, Kali Prasad Samantray, Rabi Narayan Mohanty, Satya Das, Pitabas Mohanty, Bipra Nayak, Saroj Kumar Parija, Prashant Mohanty, and Abani Mohapatra. 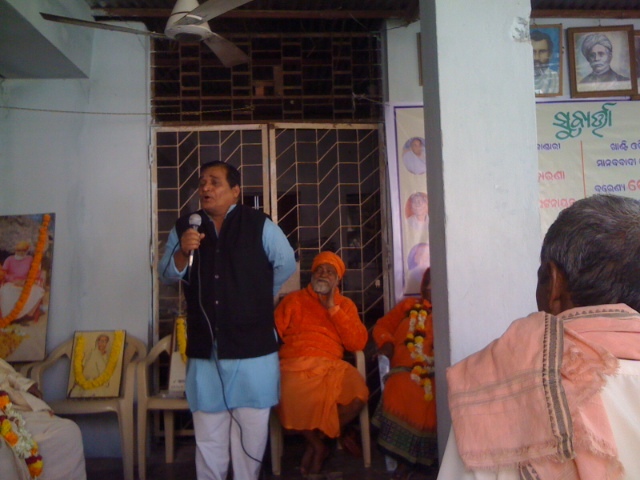 Satyabadi Baliarsingh was in charge of reception. Eminent Guru of Astanga Yoga, Sadguru Sudhakar Baba of Muni Samaja was conspicuous by his august presence throughout the function. One of Orissa’s great orators and editor of Subartta, Sri Pradyumna Satapathy stressed on re-enkindling of pride in every Oriya for his language, land and tradition of sacrifice in the cause of the people. 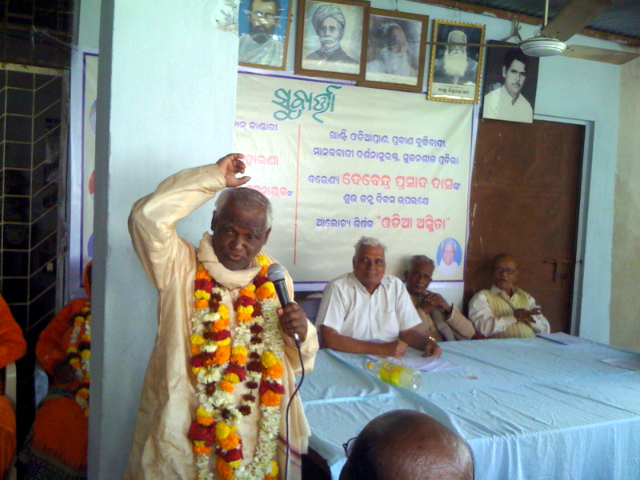 In acknowledging the felicitation Sri Das, respectfully addressed as Debendra Bhai, gave a clarion call for depiction of Oriya virtues in manners, in every public utterance, in every relevant work of letters, and in dealings with the next person. He called for total prohibition of manufacture and marketing of alcoholic beverages and intoxicant drugs in interest of the people. Addicts must be kept off offices, he said. With due regard to Debendra Bhai’s clarion call I am to only remind that when Govt. Brews Liquor and gives considered permission to open out-lets for our citizens of Gandhi Country all I can say and repeat………….Lankare Hari Man………..lankare…. …….. ……………. beloved ” THE ALL PERVADING GUTKA-SIR “. Let’s wait -n-watch….